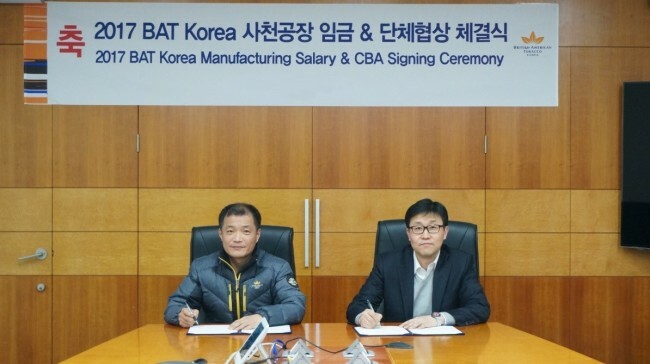 Global tobacco company British American Tobacco Korea has signed a collective bargaining agreement with its Sacheon factory’s labor union, agreeing to bolster cooperative relations, the company said Tuesday. The negotiation was finalized in February. “The latest agreement is the result of our consistent efforts to further consolidate a cooperative labor-management culture. The Sacheon factory, based on such stable relations, will continue to cement its status as a global hub in addition to improving its productivity,” said BAT Korea’s Operations Director Lee Seong-kwon. In 2014, the company and the union signed a bilateral agreement for an amicable labor-management relationship, followed by a three-year salary negotiation in 2015. In line with such efforts, BAT Korea’s Sacheon factory hosts a “You & I” session every month, during which representatives from the management and the union gather to discuss ways to achieve mutual growth of the company and its employees, the company explained. BAT Korea’s Sacheon factory is considered the most innovative facility among the other 44 factories run by the BAT Group. It has over 360 employees since its first rollout of exports in 2004. In 2008, the factory received its first export award from the Korea International Trade Association for achieving $10 million in exports. As of 2016, Sacheon produces merchandise worth $100 million.